Chatting with ALICE if fun. Human: you have one million toes? ALICE: That's an interesting question I don't hear everyday: Do I have a million toes. Human: are you friends with your toes? ALICE: Yes my toes is one of my best friends. I got 8 out of 10, and the ones I got wrong were legit, and I thought they were fake. So I guess I am safe. Your best bet is to use a program like spoofstick, and type in your own url's. Handy little guide to owning a gmail account. If you don't have one, scroll down to see my current contests to get one. This is why companies like Google do so well, they are willing to play the game and make themselves available to all. I guess nobody is perfect...I have upgraded have you? I had previously posted on a bamboo bike, but I think this one is going to be a little more ridable. Maybe I should trade in my Rocky Mountain Slayer? Here is the Google explaination, but go look for yourself. I think my political leanings are starting to show. But politics aside, this one seams really basic to me. Yes genocide was occurring, yes the country was a threat to the world. BUT, one of the tenants of democracy, as I recall, is that the needs of the few must be protected. Here is my definition of freedom: The right to do what ever the hell you want to do, up until the point your freedom infringes on another’s freedom. Nothing had occurred in Iraq that had infringed on our freedoms. Yes, they definitely threatened our freedoms, but infringed...no. One of the drawbacks of being the good guy, is you don't get to choose who the bad guys are. The benefit of such a policy is that you do not create bad guys, and your job as a good guy gets easier. Name a major religion, and it will tell you not to cast the first stone. The most ironic part of this entire situation, is that the religion the Bush professes to follow, preaches directly against his course of action. Oh well, I guess there is always 2008...go Nader! I have been milling around the site today, at looking at my poor stats, and trying to figure out ways to make the site more interesting. I did find some interesting information about you, the viewer, and I thought I would share. Looks like most of you are from the US, but it looks like my audience is world wide. This one I was actually surprised by. Lots of you are spending some serious money on your monitors..I may have to start rethinking my website design. This is a beautiful memorial and long over due. It is being put in place in Berlin, and if very fitting. I can't read the text, so I can't give you much in the way of detail, other than to say that it is breathtaking! Thanks to Dave Diamond, we now have an English translation. Thanks Dave! I added a notify by email jobby at the bottom of the sidebar. I don't know if I will keep it or not, but I thought it would be a good way to keep ya'll up to date. This blog has been a lot of fun over the past few months, and I think it will continue to entertain me, and hopefully a few others. I have been making a lot of little tweaks over the past few weeks, and I think the blog is getting to where I want it to be visually. So now I guess it is time for a little more content. I will still be doing some of my one liner posts, and just letting you, the reader figure it out from there. But I want to start adding in more reviews, comments, opinions, and fun stuff like that. I guess we will be finding out together how good of a writer I am. And if it all goes horribly awry, I'll just go back to posting one liners again. Thanks to those of you who have been reading, and welcome to those of you who are hear for the first time. Hopefully it won't be the last! 2. Name it "George W. Bush." 5. Your PC will ask you, "Do you really want to get rid of George W. Bush?" 7. Feel better, don't you? I'll throw in an unrelated GIF for you to enjoy while you wait for the video to load. Lots of fixes, and a painless installation, what more could you ask for? What do you get when you let a small group of hamsters make music. Surprising, you get a tune that is pretty good. Sort of like a Westerner listening to Chinese music. Make sure to listen! The ugly side of blinking..
With a positive CNET review, I am feeling pretty good about this program. Load up all your free email accounts, and access them all from one window. The numbers represent the number of new emails in each account, and the colors are coded so you can view it in your systray. I don't know if you can run multiple accounts under one domain though, so it will require a bit more playing with before I employ it. This site is easily confused, and very limited in the historical questions it can answer. But, it has a lot of potential. My suggestion would be to keep an eye on it. This is an amazing project. This guy drove accross the US taking a picture every mile. The project is documented very well. You can view at 1 mile, 25 mile, or 100 mile intervals. "Join Matt Frondorf as he drives from the Statue of Liberty to the Golden Gate Bridge, his camera clicking at every mile. Retrace his trip through the Picture Viewer"
Okay, I know I got swept up in the excitement yesterday, but I am drawing the line today. Bluetooth cassette tape, it alows you to play your bluetooth enabled MP3 player through your tape deck. But I must again ask, who the hell still has a tape deck, and if you do, do you own a bluetooth enabled MP3 player? File this one under creepy. Grab the phone, put it next to your dyson, and it will tell them what is wrong with it. Gizmodo does a very good job of explaining it. I posted about this being on the way, well now it is here. Hopefully it is the same length as a regular SD card, so I can put it into my Kyocera 7135! Makes me wish I still had a tape deck. This flash player, when put into a tape deck, behaves just like a tape, only with all the benefits of a flash player! A brave test in advertising...according to the site, the money is real! So, you buying a pair of pants online, but you want to know what they are going to look like on you. What you need is a virtual model. 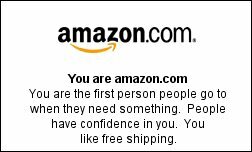 Describe yourself to the site, and then go shopping! Microsoft and Symantec are backing a plan to create a severity scoring system for software holes. Lockergnome says"One Minute A Month Can Eliminate 100% Of Spam"
This is so cool. The program will take any image, and turn it into ASCII art. View source, and copy. A three-year-old has become the youngest member of the high IQ group Mensa after taking a series of tests run by psychologists. There is nothing like good design done right. I thought that I was in love with this monitor just looking at the specs, but now witht a closer look, I really want it! Be sure to watch the video, first glance I was pretty excited, but after watcing the video, I am not so sure. Free Gmail account to the first one to post this guys name! Now you can take a piece of Disneyland home with you and not get arrested! My sister wants to go here next time she is in Seattle. GameRival - Free Online Games! Spamusement! Poorly-drawn cartoons inspired by actual spam subject lines! : "Poorly-drawn cartoons inspired by actual spam subject lines!" Lord knows how many times I run into this issue, and had to figure out someway to FedEx Overnight a fresh brain, and make sure the box didn't leak. Well finally, someone posted instructions. smashTheTONES :: Why would you pay FIVE BUCKS for a ringtone or graphic??? I am positve that Mesdag will be ordering one as soon as he sees the post! Hundreds of music CDs, zero dollars*, obtained legally. BBSpot.com - Which Website are you? RedNova News - Can This Black Box See Into the Future? This is an interesting article on the mind, the soul and how they relate to physics. I don't know if the box can predict the future, but it sure is giving scientists a lot to think about. I posted a while back about an anti-molestation jacket. This is the updated version. I think that my favorite part is that the hair raises up, like an animal. Be sure to watch the movies.